When George Washington became the commanding officer of the Continental Army, he accepted no pay from the Continental Congress. He believed in liberty and in the ultimate goal of independence from Great Britain. 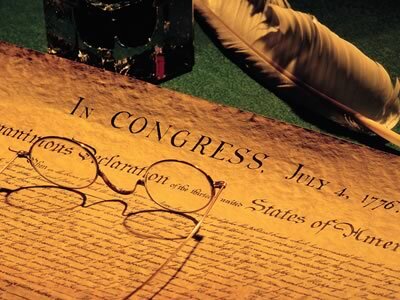 When he was elected President of the United States (after the war and after the Constitution had been ratified), he did select to accept payment for his service as was defined in the US Constitution. He did this so that the presidency would not just a position that could be sought by the rich but also by ordinary citizens. Today, it often seems as though the President and most of the members of Congress are rich and that only the rich can be elected into these offices as campaigns have grown exponentially expensive. And usually once someone is elected, and districts are gerrymandered to keep them there, they usually aren’t voted out unless there is a scandal. These days, most politicians seem to leave when they get a better deal from the private sector. They essentially become a lobbyist… even if that is not their official title. This isn’t saying that being a member of Congress doesn’t have lucrative perks. They are quite nice. Base salary is $174,000 (leadership gets plenty more). They get a free “company” car and free parking, along with free flights almost anywhere. They get a free month of vacation (August), free membership to a top-scale gym though they do have one inside the Capitol now (which we the taxpayers paid for but we aren’t allowed to see… not even the media has been allowed inside). As for “retirement,” they get a 401k and a pension, and full retirement benefits which includes up to 44% of their salaries. Even their spouses can get benefits once the member of Congress dies. However, contrary to popular belief, members of Congress do not get free healthcare. They pay 28% of the total premium and get to choose from 10-different selections, just like any other federal employee. Now to shift things back to the Executive Branch. As of 2001, the President earned $400,000 ($519,979 in 2012 dollars) plus a $50,000 non-taxable expense allowance. In 1789, George Washington was paid $25,000, which in 2012 dollars is the same as $673,451. Starting in 1959, upon leaving the office, they receive a pension and an office and staff. Their pension is based on the salary of the current administration’s cabinet secretaries. As of 2012, that amount was $199,700. They also receive travel funds and postal privileges. And if a President had served in Congress at any time, then they can still receive their congressional pension as well. President Obama will not be eligible to collect a congressional pension as he did not serve the mandatory 6-years. From 1965-1996, former Presidents were entitled to lifetime Secret Service protection until the President’s death. This would hold for their spouse and children until aged 16. Any President sworn in after January 1997 would only be allowed such protection for 10-years after leaving office. This was changed however, and the previous rules were reinstated by President Barack Obama on January 10, 2013… granting him and President George W. Bush and all future Presidents lifetime secret service protection. Up until 1959, Presidents left office with no pensions and no other perks, and they usually left office flat broke from having to pay for their own staffs. Congress likes to give themselves great salaries and wonderful perks, but then they like to turn around and complain that there is no money for anything and that government is too big. It is no secret that government is too big, and it has all started with the people that are making it too big… Congress itself. They give themselves these great retirement packages but then want to cut Social Security and Medicare… two programs that the beneficiaries have actually paid into their entire working careers. It is their money. They worked for it, and they earned it. They want to talk about reducing the size of government, cutting government spending, and forcing government workers to take pay freezes and furloughs, but yet they aren’t playing by the same rules themselves. They always manage to leave themselves exempt from what they are forcing on others. And most of the perks and pay raises they give themselves, they do so “under the radar” of the American people. Even the media tends to either completely miss it or just completely ignores it which thus allows Congress to get away with it. Sequestration is due to hit at the beginning of March… pushed back from the beginning of January. These are automatic across-the-board spending cuts to our national spending. It was passed in the summer of 2011 as part of the debt ceiling deal. A group of bipartisan legislators was supposed to come up with $1.2-trillion in budget cuts, and if they couldn’t, then the sequestration was to take effect in its place. The sequestration, which does include defense cuts, was supposed to be so bad that it would force both sides to work together to find something better. However, the group of legislators failed to find common ground and the sequestration was set. It was only pushed back to March from January as part of the fiscal cliff deal reached on January 1… hoping that the new Congress could come up with a better plan. In these two months, neither party has seemed that focus on the impending cuts. During the presidential election last year, President Barack Obama, in a debate with Republican-nominee Mitt Romney, emphatically said that the sequestration would not happen. Yet, here we sit. The total for the sequestration cuts is approximately $1.2-trillion over 10-years. According to the Office of Management and Budget (OMB) and the Congressional Budget Office (CBO), the total of cuts for the current fiscal year under the new amended agreement from the fiscal cliff deal is $85.3-billion… $42.7-billion from defense and $42.7-billion from non-defense. 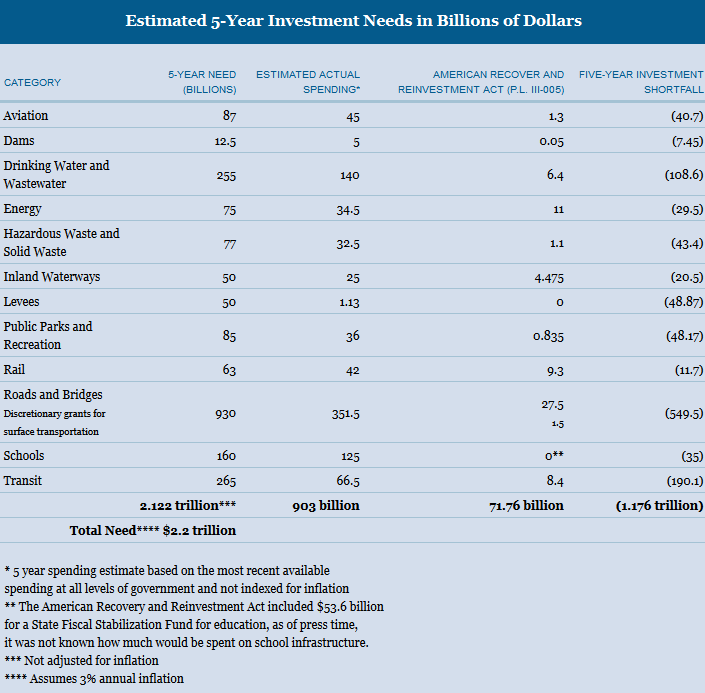 To put this into some perspective, the overall projected spending (budget) for 2013 is estimated at $3.8-trillion. The amount of revenue that is projected for the same time period is only $2.9-trillion. This leaves the country with a debt of $901-billion. We are talking about $85-billion out of $901-billion. This is nothing more than a small slice of our debt. And overall for the total 10-years, it roughly only amounts to a 3% cut. This is a super tiny sliver of our spending. So it’s just a small amount of spending that is being cut. For those 10-years, how does it stack up piece by piece? Now this is total for all 10-years combined. Entitlement spending will roughly be $26.1-trillion. From that, only $171-billion will be cut. Non-defense discretionary spending will be $11.3-trillion with $322-billion being cut out of that. Defense spending will see $492-billion cut from $5.3-trillion. Net interest will see a $169-billion out of $3.6-trillion. These numbers have been provided by the Congressional Budget Office. From these numbers, defense does take the biggest hit at 42.6% of the sequestration cuts. The net interest takes the smallest at 14.6% and entitlements at 14.8% of the cuts. Regardless of the percentage of cuts each section is facing, they are still just a small fraction of the overall spending. 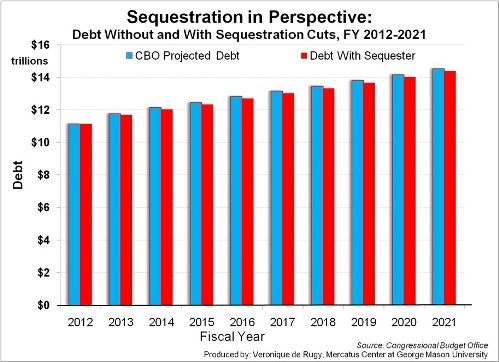 In fact, the CBO projects very little difference in our debt with or without the sequester in place. So with the sequestration cuts just around the corner. Government agencies have begun to take preliminary steps to prepare for them. This includes notices to workers that might be furloughed to what cuts will come from certain programs. The heads of these government agencies have called upon Congress and President Obama to come up with a new plan to replace the sequester with other forms of cuts. President Obama has said he will now veto any legislation that takes away the sequester. Since the department heads haven’t made any headway with their messages to the politicians, they have now resorted to other tactics… specifically by announcing what they intend to cut which does include some jobs. The defense department was supposed to deploy the carrier Harry S. Truman and its group to the Persian Gulf, but instead has decided to keep it in port citing the sequestration cuts. So basically, the defense department is saying that to get to its $42.7-billion in cuts for the year, one of the only ways is to keep a carrier group at home when we have previously committed to keeping two groups in the Persian Gulf because of the situation with Iran. There are apparently no other places in the department, no wasteful spending at all, that could be cut from its budget so this is what they are going to do. It’s almost as if they are going to hold Congress hostage until it replaces the sequestration. Other departments are going to the same lengths to put pressure on Congress, but the defense department has been the most vocal over the cuts it is facing, which, quite frankly, it desperately needs. Our defense budget is already over-bloated and disproportionate to our own budget and to even the rest of the world. Conservative columnist George Will stated that Congress should let the sequestration stand, and I wholeheartedly agree with him on that point. The federal government does have a spending problem. Though the sequestration cuts are only a small fraction and will hardly make a dent in our spending, it still needs to take place. The various departments want to whine and spend their time trying to reverse it, but they’ve also had ample time to actually figure out where wasteful spending actually occurs in their departments and eliminate it. Quite frankly, the cuts needed to be even deeper in order to actually make a sizable dent in our deficit spending. There was a compromise on raising revenue in the January 1 fiscal cliff deal. Now the compromise on spending cuts from 2012 needs to stand as well. We cannot continue down the path we’ve been heading. Big decisions have to be made… ones that call for increased revenues (and not just income tax increases) and significant across-the-board cuts and elimination of wasteful spending. He came up with what he called the American System. His name was Henry Clay of Kentucky. In 1806, Henry Clay was elected to the US Senate by the Kentucky legislature. At which, he set out at once for the nation’s capital city, Washington DC. Part of his route would be via boat while more of it would be via the nation’s roads… or what were considered roads at that time. It was upon this journey that Clay’s zeal for an internal improvement program for the nation were formed. He had already had the concept for such a program while serving at the state level, but now he wanted it moved to the national level, and it would become a lifelong goal while he served in Washington. Clay’s American System had three parts to it… a tariff (which was passed in 1816), a national bank (which Clay originally favored not rechartering the First Bank of the United States created during the Washington administration, but then realized the error of that and favored the creation of the Second Back of the United States in 1816), and internal improvements (building of canals, roads, dredging harbors, etc.). During Clay’s time, internal improvements (or what we today call infrastructure) was done at the state and local levels. The federal government didn’t think it had the authorization to do such things. In 1816, in the waning days of his administration, President James Madison had asked Clay for an internal improvement bill. Clay fought hard opposition to get such a bill through the House and Senate. On a night where he had been invited over to the Octagon House (where President and Mrs. Madison lived after the British burned the White House in 1814), the president informed Clay that he was going to veto the infrastructure bill that had been sent to him on the grounds that he felt it violated the US Constitution. Despite that setback, Clay continued to be a voice for internal improvements over the decades to come. He ran on the issue in the 1824, 1832, and 1844 presidential elections. The biggest infrastructure project that would get passed from Clay’s American System was the Cumberland Road. A fight over internal improvements (or infrastructure) seems oddly familiar during this election year. In fact, it sounds oddly familiar over the last four years. Democrats in Congress have wanted to fund fixing our crumbling infrastructure while Republicans have balked at the idea… mainly on the cost and needing it to be offset by cuts elsewhere in the budget. Certain infrastructure projects, usually referred to as “shovel ready” projects, were a part of President Obama’s 2009 stimulus package which aimed at putting Americans back to work as quickly as possible. But regardless of the stimulus package, America’s aging infrastructure is crumbling at an alarming rate. What has me on this particular topic is a recent column in Governing magazine by Alex Marshall. In his column, Mr. Marshall says the US doesn’t invest in major infrastructure projects like it once did and is being passed by other nations (i.e. the Chunnel between Great Britain and France, the Oreseund Bridge between Denmark and Sweden, and the Gotthard rail tunnel, etc.). While this may be the case since the United States has been investing in massive infrastructure projects for most of the 20th century (i.e. the Golden Gate Bridge, the Overseas Highway through the Florida Keys, the Verrazano-Narrows Bridge between Staten Island and Long Island, the Hoover Dam, etc. ), it doesn’t mean that we are necessarily “being passed up”. Continuing on from that, Mr. Marshall claims that we should be spending more money on giant infrastructure projects to recapture the American spirit and put people back work. And though I don’t disagree with Mr. Marshall’s idea of recapturing some pride in our country and getting people back to work, I don’t think adding to our current infrastructure is the answer. He’s close to it though. Instead of investing in new infrastructure on such a grand scale (which still happens from time to time), we should be investing the majority of that money in rehabbing our infrastructure that is already in place. If rivers, canals, and harbors aren’t constantly dredged, they fill up with silt. How does that help commerce between various ports in our own country and for trade with out countries? The southern half of the Intracoastal Waterway which runs up the Atlantic coast is filling up with silt because it’s not dredged as much as the northern-half. The concept of such a waterway can be traced back to Treasury Secretary Albert Gallatin in 1807, but didn’t really get going until the Rivers and Harbors Act of 1909 and 1910. From the years 1910-1914, the navigation channels were deepened. The Intracoastal Waterway also proved useful during wartime as it protected ships traveling the coast from enemy subs and the water was a lot smoother for sailing than being out on the open ocean. Even the mighty Mississippi River has to be continuously dredged so that river traffic is not impeded. It is still the great inner-continental “roadway” linking various ports in roughly 2/3rds of the US. Earlier, the number of deficient dams were listed as provided by the Infrastructure Report Card. Throughout parts of Kentucky and Tennessee (where dams were part of the Tennessee Valley Authority… part of President Roosevelt’s New Deal), and especially up in the Pacific Northwest, these dams are a vital source of life. They create tourist destinations, provide water to communities, help with flood control, and assist river navigation. If one dam were to crumble enough to let out the enormous amount of water held behind it, the people and towns downstream would be devastated. On May 31, 1889, the South Fork Dam suffered a catastrophic failure releasing 20-million tons of water racing downstream toward Johnstown, Pennsylvania. The flood killed more than 2200 people and caused more than $17-million in damage. Many of our dams and bridges were built as part of the New Deal during the 30s and 40s. Most weren’t designed to last this long. They are in constant need of repair so that they can continue to hold back the enormous amount of pressure that is pressing up against their walls. One could only imagine what a catastrophic failure would cost in today’s money and in lives… especially if the wall of water hit a major population area. 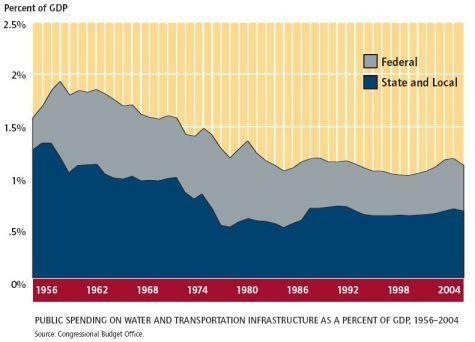 Over the last few decades, money spent on infrastructure has fallen both at the federal and the state level. Even now, talks have stalled in Washington between the House and Senate versions of a new federal transportation bill. (The Hill) This would include funding for both new projects and current projects… both for building new and for rehabbing old. So while I do agree with Mr. Marshall’s claim that we need to be investing in infrastructure in our nation, I believe that it’s not the right time to be seeking on a lot of huge projects but rather to rehabbing what we already have. He talked about all the great things we have built on in our past, and they still do stand as a great example to American ingenuity. There will still be those types of projects, even if they aren’t as numerous as they once were. But part of that American ingenuity (or American pride) should be the upkeep of those projects. If we are proud of them, then we should be willing to make sure that they are around for generations to come. The legacy of those great projects isn’t just what they accomplished, but their longevity. As I continue reading about Henry Clay, I must wonder what he would think about all of our internal improvements that we have today… his American System come true. He fought his entire political life for such things with only minor victories, but now we see it as commonplace for the federal government to take the lead on such projects.